Irish rider Felix English is riding the sprint at the European track championships in Pruszkow mainly for the experience, but he unexpectedly took a major scalp in this morning�s 1/16 finals of the event. Set to race against fastest qualifier Chris Hoy in the heat, he was distanced by the Olympic champion�s acceleration but continued to ride hard. Hoy thought he�d no problems and eased back, only to be surprised by a rapid English on the finishing straight. The 18 year old hit the line a wheel ahead, ensuring that the multiple world champion was on the way home. He was asked if he would try to take a medal. English, who used to compete for Great Britain but who declared for Ireland, said he would do his best but said that he would be closely watched by the other competitors after putting Hoy out. So it proved, with the rider being beaten by Denis Dmitriev (Russia) in the next round. He finished second in his round of the repechage and with the winner of each heat the only one to advance, he didn�t progress any further. Still, an 18 year old putting Hoy out is a big story, and one which ensures that the trip to Poland will be a memorable one. 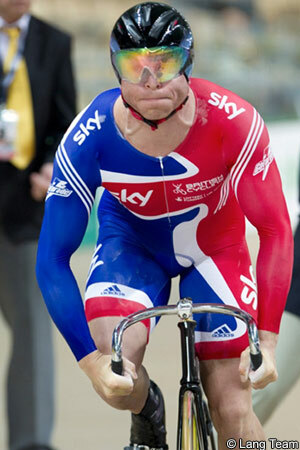 Martyn Irvine was also in action today, and is currently making his way through the Omnium events. Meanwhile Irish trio Ciara Horne, Jennifer O�Reilly and Caroline Ryan were 12th in the women�s team pursuit yesterday. They clocked a time of 3 minutes 37.072 seconds for the 3km distance. The British riders Katie Colclough, Wendy Houvenaghel and Laura Trott were quickest in qualification and went on to take gold.